I have a small application continuously running on Raspberry Pi board. Sometimes, in my country, we have (short time) mains power failures. In such situation, my Raspberry board, powered by the wall adapter, turns off immediatly, without any attention for open files, transmissions in act, etcetera. This is really a problem. I decided to use some materials purchased in the past on ebay to realize a small power back-up unit, using a single Li-ion cell. First of all, you need for a battery charger circuit, to maintain the back-up battery fully charged. The battery is 3.7V typical, and 4.2V when fully charged, but the Raspberry Pi board wants 5V supply, so we need for a Step-Up circuit. As third element, we need for a switch that disconnects the load from battery when mains supply is present, ‘cause the charger can’t see the real battery level if you connect a load while charging. I suggest to read this document released from Microchip: AN1149. Starting from the left, you can see the circuit connected to the wall adapter and the battery charging (red led ON), then the battery fully charged (blue led ON), then the wall adapter has been removed (both leds OFF). Note that the multimeter measures 5.13V in all cases. The step-up module can be found with a search on ebay, looking for step-up regulator with variable voltage (mine is based on recent XL6009 chip). The XL6009 regulator is rated for Vin_min = 5V, but I tested that works with 3.5V. For best operative conditions, look for a step-up module that mounts an LM2577S-ADJ chip, that is rated for Vin_min = 3.5V. 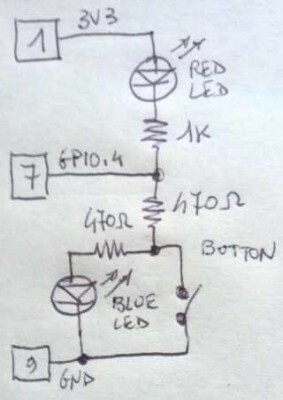 Note that you must trim the variable resistor to have 5V output. Please, connect a 1K resistor as load to the output when setting the Vout, ‘cause there is a capacitor that remains charged when you turn the trimmer decreasing the output voltage. After setting, remove the load resistor. And finally, look at the next picture. The circuit is connected to my Raspberry Pi board. In the animation you can see that the board doesn’t turn off when the wall adapter is disconnected. The time of back-up depends from the capacity of the cell that you use. Remember that the current drawn from the battery (when wall adaptor is disconnected) is the nominal current of the Raspberry Pi board multiplied for the efficiency of the step-up in converting from Vbat to 5V. Test conditions: battery fully charged, Raspberry Pi running Raspbian Wheezy and connected to HDMI monitor and to USB interface for RF keyboard and mouse. No other applications running, just the desktop and the default services. I disconnected the wall adapter exactly at 17:17 . 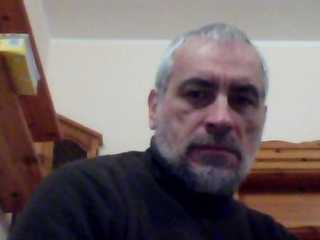 Test results: the battery discharged from 4.2V to 3.7V (about 20% of residual charge) at 18:18, so in about 1 hour. Please, note that a 3.7V cell must never be fully discharged. If the cell goes below 2.2V, it will probably not recharge anymore. If the cell is “protected”, probably has an electronic switch that disconnects the battery itself from the load when such limit is reached, but if it is a “pure” cell, you must avoid the undervoltage condition. I want to do more or less that you are describing, but power outages are very rare where i live. will it potentially harm the battery that it will be kept fully charged all the time? The charging IC “disconnects” or “floats” the battery at the end of the CC/CV cycle, so when 4.2V is reached and the current flowing into the battery is less than C/10, where C is the current programmed via the R_chrg resistor. If you use 240 mA battery, modify the standard R_chrg on your TP4056 charger circuit in order to set the charge current to about 120 mA (battery C/2). I am still very new to selecting more advanced components, but will i be able to use an AO3401 mosfet (http://www.aosmd.com/pdfs/datasheet/AO3401.pdf) instead of your example? I can see that the GATE voltage is rated at +-12v which is the same as the PMV48XP, but the AO3401 is rated at 30v/4A and i dont really know what other characteristics is important to selecting the right mosfet? I looked at the AO3401 datasheet and it seems to be right for this use. 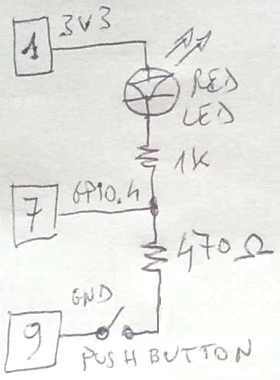 You are right, I used two low-drop Schottky diodes to obtain a “very-low-drop” diode. 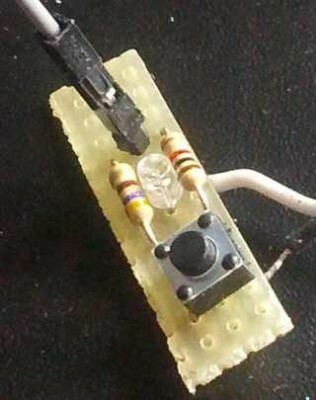 If you have a “natural born” very-low-drop diode, you can use just one. Note: pictures are taken with leds off, red led on, blue led on. 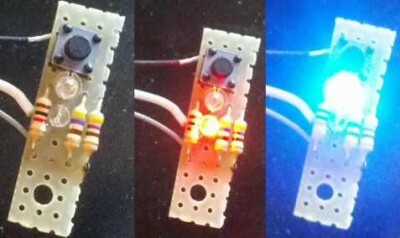 Normally, the red led is lighted for 200 mS, then the button is sampled for pressed state. If the button is pressed for a time between 2 and 3 seconds, then the variable toggle is inverted. When toggle is “1”, after the red led turns off, the blue one turns on for 200 mS. If the button is pressed again for 2-3 Sec, the variable toggle is inverted again and at next cycle the blue led will no more turn on. When the toggle variable changes, there are two actions performed by the script : if toggle is 0 (off) then a call to “killall x11vnc” is performed, while if is 1 (on) a call to “x11vnc” is done. This means that I can control the start or stop of x11vnc server with my pushbutton. If I press the button for a time over 5 seconds, there is a call to the “poweroff” and the board will turn off. Please, note that when the pushbutton is pressed the blue led can’t turn on, while the red one will be forced on (at low current, 1mA). I’m using the Raspberry Pi board in some projects. Many of these needs to run 24/7, so the hardware has battery backup in case of power fail. Sometimes, the device controlled by RPi board has to be powered off for maintenance, so it’s also necessary to turn off the control board, but there’s no video, no keyboard, neither mouse attached. The operator must connect all of these to perform a clean shutdown. Ok, that’s unacceptable: I decided to add a blinking led to inform the operator that the board is running and a switch to manually perform the shutdown, without the need for keyboard, mouse and video. Now, we have a double function pin. Here is the listing of a Python script I realized to make all this principle working : it’s named “service.py”. The main loop has 1 Sec total time : led turns ON for 200mS (so the GPIO is used as output and value is 0) then turns off when the port mode changes to input. After a delay of 100mS the pushbutton state is tested (twice) and a counter is incremented if the switch is closed; if the switch opens, the counter is reset to zero. When the counter reaches 10, so the button was continuously pressed for 5 seconds, the led is forced ON putting the GPIO in output mode with value 0. The shutdown command is then sent to the OS and the Raspberry turns off. At end of shutdown the led that was fixed ON will turn off, obviously. Note: when you push the button, the led will turn ON ‘cause you connect the cathode to gnd via 1K + 470 Ohm resistence, but you still can see the 200mS blinks due to difference of current flowing in the led when the GPIO is in input state and in output state with value = low (gnd).